Authors: Jesmin, R. & Mian, M. A. K.
Authors: Rai, P. K., Sarker, U. K., Islam, A. K. M. S., Rahman, M. A. & Hasan, M.
​Abstract: To estimate fungal infection range in local and hybrid lentil seed varieties in Bangladesh this study was implemented stepwise. After collecting healthy and qualified lentil seeds from different location of Bangladesh, purity test was scrutinized as well as germination capability of seeds was also checked through blotter incubation method. Non-germinated seeds were then observed under stereo binocular microscope firstly and then on sophisticated camera attached light microscope to identify which fungus species infected them. 15 local and 15 hybrid varieties were taken and there were different varieties of fungal infection happened. Five of the fungal species infected local varieties whereas five species attacked hybrid varieties. As Bangladesh is agriculture depended country and lentil is one of the important crops in our country, farmers will be awarded of which fungal varieties are responsible for lentil seed infection through this study and can increase lentil production by applying appropriate bio-fertilizer against specific fungal species. Azad, S. A., Mamun, M. A. A., Mondal, K. J., Alim, S. & Rahman, M. M. (2016). Range of various fungal infections to local and hybrid varieties of non-germinated lentil seed in Bangladesh. Journal of Bioscience and Agriculture Research, 09(01), 775-781. Azad, S. A., Mamun, M. A. A., Mondal, K. J., Alim, S. & Rahman, M. M. "Range of various fungal infections to local and hybrid varieties of non-germinated lentil seed in Bangladesh." 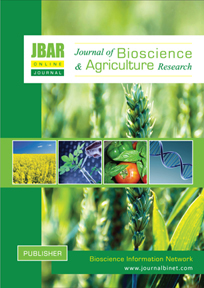 Journal of Bioscience and Agriculture Research, 09.01 (2016), 775-781. Azad, S. A., Mamun, M. A. A., Mondal, K. J., Alim, S. & Rahman, M. M. Range of various fungal infections to local and hybrid varieties of non-germinated lentil seed in Bangladesh. Journal of Bioscience and Agriculture Research, 09, no. 01 (2016), 775-781. ​Abstract: Four bottle gourd varieties and lines (V1: BARI Lau-3, V2: BARI Lau-4, V3: LS 0012-5-3 and V4: LS 0026-5-3) and three pruning stages (P1: Pruning at two vine stage, P2: Pruning at 3 vine stage and P3: Pruning at 4 vine stage) were implied to observe the effect of pruning on the maximization of vine production in bottle gourd. V4 produced maximum number of vine (117.2/plant) and highest vine yield (10.2 t/ha) among four varieties while P3 produced maximum number of vine (109.2/plant) and highest vine yield (9.1 t/ha) among three pruning techniques. The maximum number of harvested vine (118.0/plant) and highest vine yield (10.73 t/ha) was found from V4P3 which was statistically followed by V4P1 and the lowest vine yield was recorded from V2P1 (6.62 t/ha). LS 0026-5-3 along with pruning of terminal shoots four vine stages can be recommended for better vine production in bottle gourd for use as leafy vegetable. Ali, M. R., Halim, G. M. A. & Mehraj, H. (2016). Stages of Vine pruning for vine production of bottle gourd varieties and lines in summer season. Journal of Bioscience and Agriculture Research, 09(01), 792-795. Ali, M. R., Halim, G. M. A. & Mehraj, H. "Stages of Vine pruning for vine production of bottle gourd varieties and lines in summer season." Journal of Bioscience and Agriculture Research, 09.01 (2016), 792-795. Ali, M. R., Halim, G. M. A. & Mehraj, H. Stages of Vine pruning for vine production of bottle gourd varieties and lines in summer season. Journal of Bioscience and Agriculture Research, 09, no. 01 (2016), 792-795. ​Abstract: A reliable and reproducible protocol is established to get healthy and wellformed callus from juvenile explants of cucumber. The sterilized seeds of cucumber cultivar were cultured on MS basal medium (Murashige and Skoog, 1962). The seeds germinated after 7 days of culture with 24 hours dark photoperiod. Explants from germinated seedlings were cultured on MS medium supplemented with individual treatments of different auxins (2,4-dichloro-phenoxyacetic acid (2,4-D), α naphthalene acetic acid (NAA)) or cytokinins (benzyl aminopurine (BAP)). Plant parts such as leaves, stems and cotyledons were used as source of explants. Callus were initiated from leaves, stems and cotyledons after 4 weeks of culture. The optimum medium for callus induction from leave, stem and cotyledon explants was MS medium supplemented with 0.5 mg/L BAP added with 1.0 mg/L NAA. The highest percentage of callus was obtained from stem explants (89.0 ± 0.75 %) followed by leave (79.05 ± 3.28%) and cotyledon (74.43 ± 1.30 %) explants. Maximum callus induction in stems (73.05 ± 2.1%) was obtained in 1.mg/l concentration of BAP. Incorporating 2,4-D in the callus induction media promoted slow callus growth and low quality callus compared to that produced on media containing NAA and BAP. Callus induced on media containing 2,4-D was friable and yellow in color. This protocol can promote the application of tissue culture technology to facilitate the genetic transformation of this species. Jesmin, R. & Mian, M. A. K. (2016). Callus induction and efficient plant regeneration in Cucumber (Cucumis sativus L.). Journal of Bioscience and Agriculture Research, 09(02), 796-803. Jesmin, R. & Mian, M. A. K. "Callus induction and efficient plant regeneration in Cucumber (Cucumis sativus L.)." Journal of Bioscience and Agriculture Research, 09.02 (2016), 796-803. Jesmin, R. & Mian, M. A. K. Callus induction and efficient plant regeneration in Cucumber (Cucumis sativus L.). Journal of Bioscience and Agriculture Research, 09, no. 02 (2016), 796-803. Mehraj, H., Taufique, T., Parvin, S., Shamsuzzoha, M. & Jamal Uddin, A. F. M. (2016). Classification and evaluation of gerbera cultivars. Journal of Bioscience and Agriculture Research, 09(02), 812-819. Mehraj, H., Taufique, T., Parvin, S., Shamsuzzoha, M. & Jamal Uddin, A. F. M. "Classification and evaluation of gerbera cultivars." Journal of Bioscience and Agriculture Research, 09.02 (2016), 812-819. Mehraj, H., Taufique, T., Parvin, S., Shamsuzzoha, M. & Jamal Uddin, A. F. M. Classification and evaluation of gerbera cultivars. Journal of Bioscience and Agriculture Research, 09, no. 02 (2016), 812-819.